Get involved! Be helpful and willing! Take pride in your work, materials, the school grounds and your abilities. Show honesty, fairness and respect for others. Speak appropriately and pleasantly to all members of the school community! Why we have rules… Lucan Community College is your school; you must make it a school to be proud of. Rules and regulations are important because they ensure that the school is able to carry out its business; they help the teachers to teach, the students to learn and teachers to teach. When everyone follows the Classroom Code and General Rules there are no problems. A happy business-like atmosphere is the best environment in which to work; such an atmosphere can be achieved if everyone follows the rules and regulations; you and your parents/guardians have signed up to them to help you co-operate with the staff of Lucan Community College as well as all your fellow students. These rules and regulations are reviewed periodically in conjunction with the Board of Management, all the staff, the Student’s Council and the Parent’s Association. Be on time, carrying your school bag and all books, copies and other equipment you need for the day. Your appearance (including uniform) should be clean and neat and should conform to school regulations. If you arrive late, you come to the Front Office for a late stamp on your journal. Write your time of arrival into school beside the late stamp. You must sign the late sheets for the relevant year. A note to explain your lateness should be in your journal and shown to your Class Tutor. Repeated lateness is highly disruptive to your education and that of the class – it must be dealt with as such by the Attendance/Punctuality Officer/Deputy Principal and/or through the usual referral process. Students are not allowed to go to their lockers except at break, lunch times and before and after the school day. All students must wait outside the classroom until their teacher arrives, lined up as shown by every teacher at the beginning of the year. When you are lining up outside the classroom, you do so quietly so as not to disturb the learning of fellow students. When the teacher tells you to do so, enter the room and follow the instructions of the teacher. Sit in the seat you were given by the teacher. Do not presume to change your seat unless the teacher allows you. At the end of class leave your table and around your chair in a neat and clean manner. Push your chair under your table and after class, leave exactly as your teacher tells you. Do not run, shout or push. Walk in the correct direction through the courtyards and in the corridors. You are permitted to go to the toilet during break times or before school. Students will not be allowed out to the toilet during 1st class after beginning of school, 1st class after break or 1st class after lunch time. If you are in serious need, ask the teacher quietly for permission. Take good care of your table and chair and your learning environment. Please do not graffiti or vandalise any property while in school. You may go into the area of the school assigned to you. No student may leave the grounds without permission. Food may be consumed only in specified areas. The college encourages students to eat a healthy snack and lunch. Chewing gum or fizzy drinks, including energy drinks, are not allowed in our school. Under legislation, it is illegal to smoke in the school grounds at any time. Do not engage in unruly behaviour such as pushing, shoving, rough play nor running around at break time as this can lead to injury. Do not engage in shouting or rowdiness either. Go to your next class promptly and line up in an orderly manner when the bell goes. First years, second years and third years are allowed home to have lunch only if they have specific permission from their parents/guardians and a lunch pass in the front of their journals. All other junior students must stay in the school building for lunch and eat their lunch in designated areas. Senior students (TY students, 5th year and 6th year students) are allowed home to have lunch only if they have specific permission from their Parents/Guardians. They are also allowed, at the discretion of the Principal, to go to the Supervalu shopping centre at lunchtime to buy food. These senior students must then return immediately to the school to eat lunch. Loitering in public areas during lunchtime is expressly forbidden. Those who stay in must stay within assigned areas. You may stay on in the school after class if you are taking part in some organised and approved activity or if you are given permission or told to do so by a teacher, otherwise, you must leave the school building immediately after finishing at your locker after the final class. Your conduct on your way to or from school is as important as within the school. You are reminded to behave in a mannerly way on the road, at the bus stop or in the bus. Complaints about students’ conduct are always acted upon. 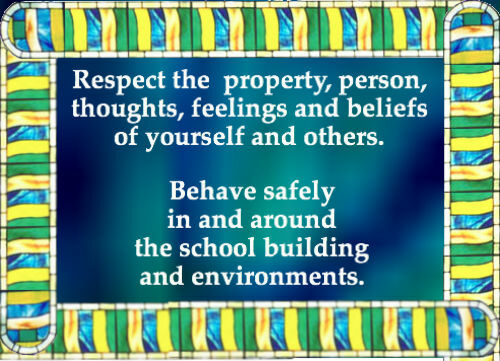 Students who are either afforded the privilege to leave the school premises during the school day or who are finished school for the day should be aware that appropriate behaviour is essential at all times. The school reserves the right to apply its full Code of Behaviour and sanctions if and when the school deems it appropriate. Teachers are addressed as Miss, Mrs. or Mr. (Sir can be used instead of the full name for a male teacher). Don’t argue with a teacher. It is quite possible to put forward your point of view without being cheeky. If you are quiet and calm you will be welcome to make your point. This applies not only in school but to your relations with adults in general. Disrespectful behaviour will not be tolerated. You may not go to the Staff Room to see the teachers during morning break or the first half of lunch break. Treat all members of college (other staff, visitors and fellow students) with the same respect as your do your teachers. Be mannerly at all times. Always treat school property and that of your fellow students with respect. Keep the school neat and clean. Don’t forget to take good care of your own property. Put your name on every book, copy, piece of equipment or uniform that you own. Lost property is stored in the caretaker’s office beside the Memorial Garden. You should always treat your fellow students as you would like them to treat you. Bullying, fighting and intimidation are regarded as the most serious discipline offences.